For the best frameless shower screen products and installation call Liverpool Glass. The team will offer help and advice on the most suitable bathroom fittings and décor which will complement your bathroom’s existing surrounds and budget. Liverpool Glass provides numerous variations and styles of custom frameless or semi-frameless screens to suit individual needs. A beautiful, functional bathroom is not only a place of relaxation and indulgence but also a showpiece when the time comes to sell the home. All frames are available in a variety of colours, making them ideal for any home or rental property. Liverpool Glass offers custom shower screen installations Sydney-wide, to ensure clients achieve a truly unique style. The team at Liverpool Glass can help clients with all their frameless shower screen requirements, from installations and replacements to emergency repairs. For all your glass needs, call Liverpool Glass first. Our friendly and efficient staff is on hand 24 hours, 7 days a week to help you. Contact us today on (02) 9607 6566. With the expert advice and knowledge of the Liverpool Glass staff, your choice of shower screen is designed to meet your requirements or architectural specifications. 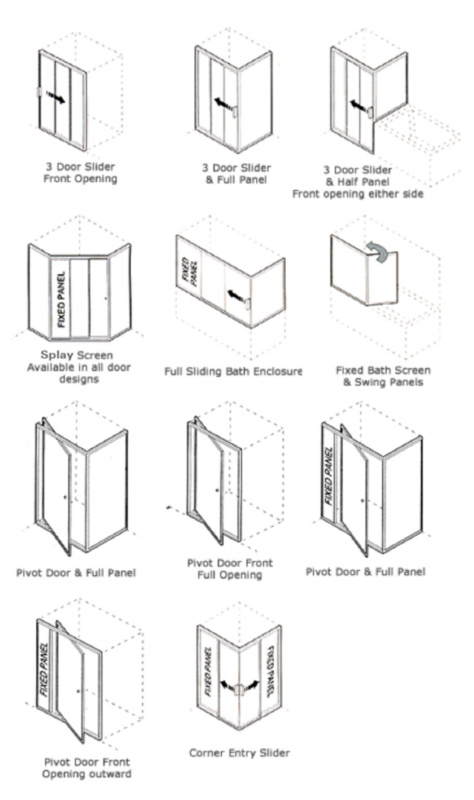 All door openings and fixed panel positions can be reversed to suit your individual bathroom requirements. Note, not all styles are available in each state. Please check with our showroom or sales representative for further details. Whether you prefer a hinged, sliding or pivot door, a unique layout, or a framed or frameless look, Liverpool Glass will supply a made-to-measure quality shower screens. Are you Interested in Shower Screens?